According to LAcity.org, fire kills more Americans than all other natural disasters combined. This is quite frightening, but do not worry, some residential fires can be prevented with dryer duct cleaning. It is recommended that residential homes get their dryer ducts cleaned every year to two years. What are some signs that indicate your dryer’s ducts need cleaning? If you are drying your clothing and the temperature is hot, but your items are not properly drying, this can be a clear indication that your ducts need to be cleaned incredibly soon! More lint on your clothing than normal. The top of the dryer is much hotter than usual. Your clothing has a moldy smell; this is because of the extra moisture that is located inside of the dryer duct. What are other ways you can prevent a dryer fire from occurring? Do not leave your dryer running when you are not home. Make sure your dryer is plugged into the proper electrical outlet. Move your dryer in order to clean behind it to avoid lint build up. Clean the screen/filter before putting in a new load of laundry. 14,043 is the number of clothes-dryer fires that occur every year, because of build up inside the dryer or dryer exhaust vent. 191,000,000 is the estimated total cost of property loss from 2008-2010, because of residential fires that started d in clothing dryers due to lint build up. 34% of residential fires are as a result of not cleaning dryer vents. Lint, dust and fiber made up 28% of materials that started and caused fires. 396 people were injured as a result of a dryer fire, and unfortunately, 29 of them died. 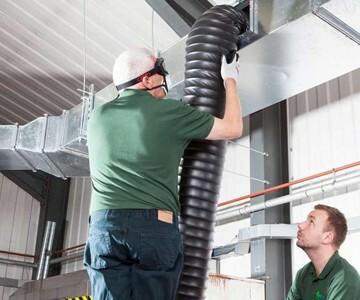 Since 1978, Action Duct Cleaning been recognized for their residential dryer duct expertise. For further information or a free estimate, contact us today.